"Majestic and towering Oaks surround this most gracious estate almost speaking to you as you saunter by. French inspired stately home perfectly surrounded in a private park like 2 acre setting provides an elevated lifestyle. Gourmet kitchen with island, breakfast bar, wet bar, & soaring window framing our oak friend. Plus palatial living room, with cathedral exposed beamed ceilings is perfect for entertaining inside & out. Five over sized bedrooms, 4 1/2 bathrooms, including a master retreat with fireplace, walk in closet, front & back yard access. Beautiful pool with mountain views, outdoor bar entertaining, bocce ball court, RV parking, and room to run. Room for horses & trails nearby. Conveniently located on the Western side of Ojai Valley with easy access to Ventura, Santa Barbara or downtown Ojai. Experience the magic here that will forever make home feel like a dream." "You will love this premier Saddle Mountain location with incredible 360 degree views! This private 4-bedroom, 4.5-bathroom home has a 3-car garage with workspace, in addition to the 4149 sq. ft. of spacious elegance in the main house. A light and bright open floor plan focuses on outdoor living and ease of maintenance. Custom touches await at every turn - from the open wood beam ceilings that travels from the living area into the Master bedroom, to the beautiful granite-topped built-ins in the dining room and French doors leading out to the impeccably landscaped grounds. The remodeled kitchen features a Chef's pantry, double ovens, a large island and granite countertops. Each of the bedrooms come with their own ensuite, allowing for comfort and privacy. Enjoy sunrises on an East-facing patio by morning or indulge in a spectacular sunset over the pool and spa by night. The property also features 45+ avocado and citrus trees, and has easy access to hiking and horse trails!" "With a private, enviable ridge-top setting in Saddle Mtn Estates affording sweeping mountain & valley views, this two-story solar powered Mediterranean home offers over 6700 sq ft on a naturally beautiful 2 acre setting & is an Entertainers Dream! Casual Spanish tile flooring flows throughout the expansive common areas including Living Rm, Family Rm, Formal Dining, Breakfast Rm & the open Kitchen where top quality appliances make cooking a real pleasure! Each of the 5 upstairs bedrms enjoy the luxury of an adjoining balcony to step out & enjoy the astounding views. Additional interior amenities include an office, sleeping porch, a poolside multi-use room for Dining, Entertaining or Games & a hearty wine cellar! But perhaps it's the outdoors that makes this Ojai property so special! Decorative interlocking brick patios surround the oversized heated pool and spa, while steps lead thru lush landscaping to the discreet paddleball/basketball court. This property must truly be experienced!" "This stunning Mediterranean home was designed by Marc Whitman, which is evidenced by the natural blend of environment and architecture throughout. From the minute you walk through the entryway, you are captured by an old world charm and exquisite attention to detail. There is an undeniable WOW effect as you step into the Great Room and take in the spectacular views of the surrounding mountains and valley. There are three fireplaces: one in the Great Room, one in the Family Room and another outside by the outdoor bbq. The Master Suite is located on the main floor and there is a fully outfitted Media Room, as well as a substantially-sized Storage Room. There are expansive views from every room in the house. The three car garage is over-sized and completely finished. There is a family orchard, and room for a pool and/or guest house." "***AMAZING VIEW** OVER 1/2 AN ACRE OF USABLE LAND**ATTACHED GUEST HOUSE**6 OR MORE FRUIT BEARING TREES**IN A CUL DE SAC*** Welcome to NIRVANA! This sprawling 6 bedroom 4 bathroom and bonus room estate with 9 foot depth pool, spa, and mature fruit trees is the perfect family home or getaway. Nestled on a lush hilltop, on a quiet cul de sac overlooking the Ventura river with breathtaking views! This .6 acre lot REALLY does have it all. From the endless views of the sunset, the vaulted ceilings, the cozy fireplace and don't forget the wrap around deck. THIS HOME IS A RARE FIND!!! The bonus to it all is the attached 1 bedroom, 1 bathroom, full kitchen, attached guest house. Bring your extended family, use it for an In Law Suite. Enjoy beautiful scenic drives along Hwy 33 and Hwy 150, with Lake Casitas and the Ojai Country Club,s championship golf courses and spa just a few short minutes away. Hike the Topa Topa mountains and soak in a signature Ojai Pink Moment Sunset. Walking distance to the local grocery store, school and bike trails, places everything you need at your fingertips. With just a 15 minute drive to Downtown Ventura's 5 star restaurants, bustling nightlife and endless oceanfront activities you would be hard pressed to find a better location." "TWO LEGAL LOTS. OVER 1.43 ACRES & Lovely 1948 HOME. The first time this property has been on the market. Great Curb Appeal! The home welcomes w/a large living room w/gorgeous wood floors & large picture window. Separate formal dining room opens to outside patio area. Upgraded kitchen w/ big center island, granite counter tops, stainless steel appliances, garden window & HUGE walk in pantry & a breakfast nook alcove looking out to back yard. In 2002, an enormous Master bedroom suite was added to the home with Large master bathroom with double sinks, separate shower and tub and extra large walk in closet. Interior Laundry room with sink off of master with outside entrance. 3 additional bedrooms all w/wood floors. 2 car detached garage has big attached workshop. Newer Electric panel installed in 1995 according to permit. A well loved and maintained home on a one of a kind property. Located on over 1.43 acres on a combined 2 legal lots with many future possibilities. Half way between the Beach and OJAI. Close to shopping, Restaurants & wineries, etc. Right of the Ojai biking and walking trails that take you from Ojai to the Beach. Come take a look!!!" "Situated at the gateway to the Ojai Valley (California's fabled 'Shangri-La') this gentleman's ranch enjoys great privacy and million dollar views! 2.58 acres of flat, usable land adorned with a charming 3 bedroom 2 bath 1941 farmhouse overlooking the wildlife habitat of the Ventura River. This tranquil horse property has the great feel of an authentic family farm - near miles of riding trails from the mountains to the sea via Ojai's equestrian/bike trail. Large country kitchen w/amazing views, dining room, breakfast room, multipurpose bonus room, plus a mud room! Master suite is large, well appointed and private. Fully fenced, private family yard with fire-pit and spectacular views. Huge deck, attached 2 car garage. Family orchard w/orange, tangerine, peach, apricot, walnut trees and hundreds of bulbs that flower throughout the year. 2 large corrals, space for parking, 2nd dwelling or pool? 90 minutes from LAX, 10 minutes to the beach and Ojai. A must see for any clever buyer!..Please call today for an easy showing appointment. Thank you!.." "This unique, custom build hillside home is perfect for entertaining and raising a family in a country setting in the new and up and coming wine country. There are 7 areas for family and friends to gather with stunning views from most. The home is completely enclosed so you have privacy and confidence in the security of children and pets. This home has upscale finishes including a large Mediterranean Mahogany arched front door w/ iron hardware and glass imported from Tahiti, Brazilian Koa hardwood floors, gourmet kitchen, butler's pantry appointed with maple cabinets, travertine floors and striking granite. Through the kitchen is the inviting conversation or formal living room, warmed by the raised hearth fireplace with a wet bar and powder room. Through the sliding door is the tiled patio with covered gazebo, perfect for the best Bar-b-ques with an attached garden storeroom. Yes, there's a view here too! The open floor plan begins with the family and dining room graced by Italian ceramic tiled balcony which runs the full width of the home with impressive views of mountains, vineyards, valleys and farmlands. Each bedroom has a private deck and the master has a large covered lanai for a private, quiet and romantic setting." "This lovely 3+2 home has been beautifully updated and tastefully finished inside & out! All New... plumbing & electrical,central heating & air conditioning, recessed lighting, kitchen & bathrooms with custom cabinetry and lovely granite & tile designer finishes. Gleaming & restored wood floors, high baseboards, newer windows, custom wood interior doors, newly painted inside & out. Master bedroom includes new large en-suite bathroom and french door to separate raised patio area. Outdoor space is an expansive .45 acre with tons of room for gardens, studio, sheds and includes a newly gunited & sparkling pool with all new pool equipment. Two gated entries on either side of property and extra large detached two car garage allow for lots of added parking and/or areas for recreational toys! Quality, design & beauty throughout make this a must see!" "This specially situated property at the end of a private road, down a private driveway, sitting on a bluff, is the ideal place for privacy, security and views. The kitchen opens to the living room with cathedral ceilings, extending out to a 350 foot wrap around deck with views of the tree tops and the Topa Topa mountains from sunrise to sunset. This 4 bedroom, 2 bath has green views from every window and the private driveway can fit up to 6 cars, plus a two car garage with extra storage with a chair lift going from the garage to the house for single level needs. This property is truly special and will not last!" "Amazing Opportunity in Oak View!! Investor special!!! Two legal permitted houses on one lot with a garage and cabin. The main house is a modular built in 1986 and is 1664 square feet with 3 bedrooms and 2 baths. The back house is 640 sq feet with 2 bedrooms and 1 bath. The lot is over 22,000 sq feet with plenty of storage for boats, RVs or anything you can imagine. The main house has a kitchen that has granite counters, upgraded hardwood floors throughout and vaulted ceilings. There is a laundry room off the kitchen. The back house has a private backyard. Call today to view!" "Oak View Geodesic Dome Home on 2 legal lots. This unique & beautiful home has been completely renovated. Featuring 3 BR, 2 1/2 BA with approx. 1800 sq. ft. Enjoy views of the mountainside with an expansive viewing deck. An updated kitchen & bathrooms, along with a fireplace, wood-like flooring on top floor, skylight & an added air conditioning, provides all the comfort to this unique and charming home. There is also a new roof. The double lot totals approx. 12,500 sq. ft. This gives you the potential to build a 2nd house or artist studio/guest house. Room to build a 4 car garage. Partially landscaped with drought-tolerant plants. Come by to take a look at this charming and distinctive property!" "Amazing opportunity to purchase 2 homes on 1 lot. This is a great lot! Wonderful mature trees, beautiful gardens, serene setting! Main home has 2 bedrooms, 1 bathroom, living room, formal dining room, kitchen, breakfast area and an office. Second home has 1 bedroom, living room, kitchen and bathroom. The property has a large carport, workshop and utility shed. The two homes are separately metered." "Very nice 3 bedroom 2 bath home. Vaulted ceilings, Large laundry room.Attached 1 car garage and 1 car carport with view deck on top.Move in ready. Easy commute to Ventura or Ojai.Easy Walk to restaurants , drink and shopping." "Welcome to this beautiful move-in ready home! Entertain friends and family in this open living/dining area with high beamed ceiling, cozy wood-burning rock fireplace, and convenient wet bar, Cook up a storm in your updated granite tiled kitchen with newer appliances and breakfast nook. Kids and guests enjoy extra large secondary bedrooms, one with massive built in oak wall unit, perfect for display and storage, the other with attached full bath. After a long day retire to your huge master retreat, complete with master bathroom with dual vanities, soaking tub and separate shower, and gigantic walk-in closet. An energy-efficient lifestyle enjoys multiple skylights and ceiling fans throughout the house for lots of natural light, newer dual pane windows, security cams and monitor, Nest thermostat system, indoor laundry room, low maintenance yards with parking for RVs and toys. Far out feel with easy access to everything - close to Ojai and the beach!" "This three-bedroom, two-bathroom bungalow sits on approximately .29 acres of flat, versatile land with a gated entry, large carport, mature trees and landscaping, garden area, fruit trees, and a dog run. The separately fenced backyard has plenty of space for outdoor entertaining against the backdrop of gorgeous mountain and vineyard views. In the front yard, a majestic redwood stands over the wood deck, while a vine-covered arbor invites guests into your home. Step through the gate in the back fence to hit the Ojai Valley Trail for an evening stroll or to head to Ojai or the beach on your bike. Or, head across the street to the Oak View Library or Oak View Park and Recreation Center. 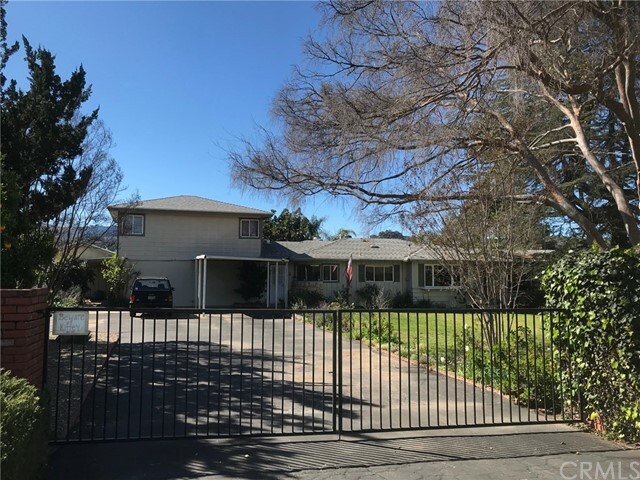 This versatile property also offers an easy commute to Ventura and is just a short drive or bike ride away from shops, restaurants, salons, a local coffeehouse, schools, markets, and the post office. With this price and location, it is sure to sell quickly, so don't miss the chance to see it!" "Don't miss this opportunity to buy a newly remodeled home in Oak View on a large fenced in lot. This charming home is a very spacious two bedroom and one bath home. New composition roof, new windows, new tankless water heater, new paint inside and out, new baseboards, new laminate flooring, newly tiled tub/shower and new cabinets throughout. The home comes complete with all new appliances. Best of all this home has central air conditioning and heating all controlled by a wifi thermostat." "This beautiful, bright and open home shows true pride of ownership! Well located on a quiet street, the property is fully fenced (front and back), with a nice sized yard, and a detached two car garage. The home is well appointed with A/C, updated plumbing & electrical, laminate wood floors, a great freestanding chimney, large laundry room, great eat-in kitchen with stainless steel appliances/updated cabinets, ceiling fans, newer carpet, and nice sized rooms. One of the best priced homes in town, and ready to move right in... TRULY A MUST SEE!"